Three Pilgrims are resting at a weathered pine tree in what appears to be the grounds of a buddhist temple. They are wearing white vestments, sugegasa (菅笠, sedge-woven hats) and waraji (straw sandals). They are also holding long walking sticks and carry primitive backpacks. The pilgrim on the right carries a juzu (数珠, buddhist rosary) around his neck. The sugegasa have the characters 金 (kin, gold) and 同行 (dougyou, fellow pilgrim) written on it, which indicates that they are on a pilgrimage to Kotohira-gu shrine (金刀比羅宮), better known as Konpira-san, in Kagawa Prefecture. Japanese pilgrimages can be broadly divided into two types. One is a tour visiting a series of temples, shrines or holy places, while the other is a visit to one particular sacred place, such as Mt. Fuji or Ise Shrine in Mie Prefecture. Pilgrimages were begun in Japan during the Nara Period (710-794), but it took until the Heian Period (794-1185) before they became really popular, and then mostly among the elite. During the Edo Period (1603-1868), pilgrimages had become so popular among the general populace that just about everybody expected to do a pilgrimage at least once in a lifetime. Even during the Meiji Period (1868-1912) pilgrimages, though clearly waning in popularity, were still common. Each person had certainly her or his own reason to go on a pilgrimage. Some went out of devotion, others to ask the deities to heal their illnesses, others again to be close to objects like a holy garment, a mummified holy man, a well that never ran dry or a statue that cried tears of blood. Many also went, because it was the only way to travel —during the Edo Period most travel was highly regulated— and pilgrimage sites were famous for their down-to-earth entertainment. With those kind of odds, it took much faith and dedication to complete a pilgrimage. People were aware of this and especially on the island of Shikoku it was common practice to give presents, even money, to henro. This custom, called settai, still survives in some manner to this day. Nowadays, people will hand a pilgrim some tissues or a hand full of mandarins. In the old days people gave lodging, food, waraji, offered to carry a henro’s pack for a while, or anything else that could help the henro, or associate the giver with the pilgrim’s connection to the saintly Kobo Daishi. In his marvelous book Japanese Pilgrimage, Oliver Statler, who researched the Shikoku Pilgrimage for many years, delightfully introduces a well-known story about settai. “Toward the end of the eighteenth century a diligent young farmer named Tokuya lived in a nearby village. It was a desperately poor village, cursed with soil that would not grow rice, wheat, barley, or the money crop of the province—indigo, the source of an enormously popular dye, a soft, glowing blue. Tokuya was an enterprising and intelligent young man and he tried very hard, but with no success, to find some crop that would do well in that soil. One day a henro passed by to whom Tokuya wanted to offer settai. SInce there was nothing in the house to give he massaged the man’s back and shoulders. While his hands worked, Tokuya talked of his village’s plight, and the pilgrim mused that perhaps sugarcane would grow there; his own home on the island of Kyushu was near a fief famous for its production of sugar and the soil there appeared to be quite like that there. Beyond that the henro knew little; the plants and the secrets of cultivation and manufacture were jealously guarded. Excited by this tip, Tokuya slipped away from home, smuggled himself into that sugar-producing fief, and worked as a farmhand for a year. At the end of that year he succeeded in stealing three stalks of cane such as are used for planting. He secreted them in a bamboo walking stick, escaped, and returned home. The man that Statler calls by his given name, Tokuya, is Maruyama Tokuya (丸山徳弥). He is still celebrated as the originator of sugar cane cultivation in Tokushima Prefecture today. Maruyama’s case is still remembered, but this exchange of knowledge was repeated anonymously again and again all over Japan. In a time before mass media and organized national education, it undoubtedly greatly helped spread knowledge and better ways of doing things. A detail of the above image clearly shows the character character 金 (kin, gold) on the sugegasa, which indicates a pilgrimage to Kotohira-gu shrine. Also notice the water flask hanging from the pilgrim’s bundle. Although, people along the pilgrimage were often generous givers, it was still an expensive undertaking. To help pay for a pilgrimage, many villages and neighborhoods organized pilgrimage associations called koujuu (講中). Every month members contributed a small amount of money to the koujuu’s fund. Once a year, a few lucky members were selected by lottery to go on a pilgrimage, their expenses being paid from the fund. Most pilgrims stayed at ryokan along the route. Thanks to the pilgrimages, a healthy travel industry developed in Japan with thousands of pilgrimage guides and countless souvenir shops, restaurants and inns along the routes. Where there were no inns, there were sometimes shacks for pilgrims, called gyoja koya (行者小屋), provided for by temples or shrines. Here they could rest and purify themselves. In general though, lodging was provided by private business and many an inn today that has a history of over 150 years can trace its roots to the custom of pilgrims. 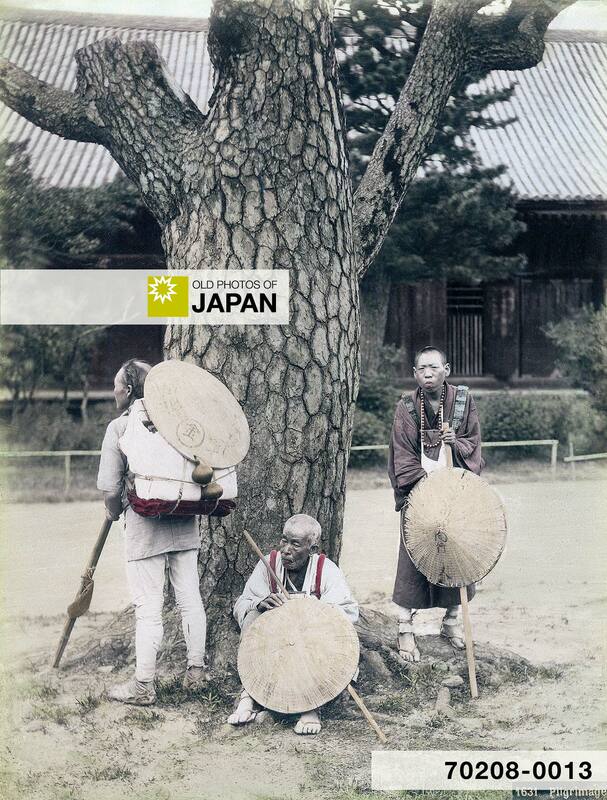 Read 1890s • Welcoming a Guest to see how pilgrimages influenced the development of lodging in Japan. 1 Dewey, John; Chipman Dewey, Alice (1920). Letters from China and Japan. E. P. Dutton & Company: 127. 2 Chamberlain, Basil Hall (1905). Things Japanese, being Notes on Various Subjects Connected with Japan for the Use of Travellers and Others. John Murray: 370-371. 4 Statler, Oliver (1983). Japanese Pilgrimage. William Morrow and Company, Inc.: 187. 6 The site Japan Buddhist Statuary has an excellent Resource Guide to Japanese Pilgrims and Pilgrimages. Highly recommended. You can also licence this image online: 70208-0013 @ MeijiShowa.com. I recently read about this pilgrimage. In the old days, the pilgrims were almost always men. Today, the majority of pilgrims are women. And of course, it is generally done by bus rather then on foot.